King Solomon is the fanciest but undoubtedly the most expensive of the options, with dinner easily costing upwards of two thousand crowns, and a Shabbat meal averaging approximately $150 per person per meal. For a nice but more reasonable option, Dinitz, which recently converted from “Kosher-style” to full-on Kosher has lovely décor, a tasty, if slightly lacking menu (when I was there at the end of July, they did not serve dessert), and a friendly, Israeli host. Lastly, and the cheapest option, especially for Shabbat, there is Shelanu, the Chabad restaurant, which has a small menu consisting mainly of parve breakfast items and generous deli sandwiches. All three restaurants have English-speaking staff, and the first two take all major credit cards, though Shelanu does not take American Express. (They will, however, except payment for Shabbos meals in U.S. dollars, approximately $80 per person for both lunch and dinner.) All three restaurants are located in Josefov, the Jewish neighborhood, within mere blocks of each other. Tourist Info: Prague has a fine public transportation system, but the tourist areas—especially those that are particularly attractive to the Jews, are all fabulously walkable. Make sure to allot a day to the Jewish Museum, which is actually a collection of old Shuls full of exhibits of centuries-old Jewish artifacts as well the Old Jewish Cemetery which contains the grave of the Maharal. There is also a New Jewish Cemetery, in which Kafka is buried. Most notable of the Shuls is the Alteneu Shul (cz: Staronova Synagoga), which is the only Shul which currently holds services (nusakh Ashkenaz) besides the Chabad (nusakh Chabad). The Alteneu Shul has been in continuous operation for 700 years (except for 1941-1945) and includes a seat for the Maharal, who used to daven there. To cap off the Jewish experience, consider a day-trip to Teresienstadt, which are easily accessible from Prague. There are, of course, a variety of non-Jewish-related tourist attractions as well. Old Town Square is something to see both at night, when you can enjoy a Pilsner at one of the cafes and the surrounding churches and other buildings are beautifully lit up, and during the day, when you might catch a live concert taking place right in front of the large statue of Jan Hus. Wenceslas Square is the place to go for shopping, and Prague Castle has a great variety of exhibits, including a cute row of shops called Golden Lane and a creepy torture chamber called Daliborka Tower. Jewish Info: Josefov (pronounced Yosefov) is the Jewish ghetto of Prague, containing all of the Shuls and kosher restaurants in Prague. 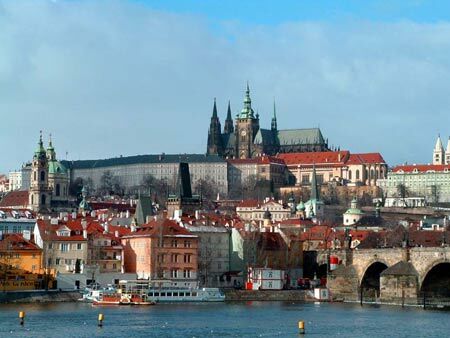 Any hotel in either Josefov or even neighboring Staremesto will likely be close enough to walk to Shul or the Kosher restaurants on Shabbat, but take into account when making plans that PRAGUE DOES NOT HAVE AN ERUV. Information about davening times and the mikvah, which is open only to women, is posted on the door of the Jewish Community Center each week.